"An intensely gripping thriller with a compelling psychological component that is unusual in crime fiction. - N. RAM. "Nish Amarnath's new book ... gives you the chills, showing how crime can unfold in both lethal and cosy setups." - THE HINDU. “A thriller that not only holds mass appeal, but also manages to accentuate the cadence of a finely crafted literary oeuvre.” - ITV AMERICA, NEW YORK. “A deeply moving and disturbing story that artfully brings to light the ills of trafficking and the trauma of abuse that women, especially the mentally challenged, face amid an emphasis on family honour among South Asian families in the UK." - SUNETRA CHOUDHURY, NDTV. "Engaging, shocking, and liberating. The greatest achievement of 'Victims For Sale' is not only its discovery of an unheard-of epidemic in our midst, but also the trust it invests in a young journalist who is herself teetering on the edge of a precipice." - PRANNAY PATHAK, HINDUSTAN TIMES. “Amarnath, [while American], manages to break the stereotypes associated with the notion that Indian[-origin] authors are typically blatantly boring with their subject matter.” - THE ATTIC LIFE. BBC journalist Sandy Raman had fled from a traumatic incident to begin a new life in the swinging city. During her first night here as a paying guest with the Sawants, she woke up to a woman with a knife … and a dark secret. An ominous stranger was found snooping on the Sawants’ home, weeks later. The family was clearly hiding something. It is only after Sandy launches a sting operation on a South London facility that she joins the dots between an institute acting as a front for a sinister nexus and the odd family she lives with. It isn't long before Sandy finds herself running for her life and chasing the truth up a trail of brutal murders. She must expose the predators and step up to the deranged kingpin of a thriving racket. Before time runs out. Long-listed for the Mumbai Film Festival Word-to-Screen Awards. Nish Amarnath is a young writer who obviously believes in doing her research, be it in the gamut of health care homes, the BBC’s White City complex or the British police system. Her style is crisp and terse, as she outlines a plot that is filled with twists and turns that keep the reader gasping… READ MORE. Office of the U.S. Consulate General in Chennai, embassy of the U.S. Department of State. 8 March 2018. ‘Victims For Sale’ is discussed on ITV Gold’s flagship ‘Vision For Asia’ program as an oeuvre that holds both literary and commercial appeal. Interview with Nischinta "Nish" Amarnath is a journalist and the author of three books: The Voyage to Excellence: The Ascent of 21 Women Leaders of India Inc., Citi and its Scuffle with the Watchdogs and Victims For Sale. [Nish] Amarnath manages to break the stereotypes of Indian #authors. Letting you traverse through the crevices and intricacies of investigative journalism, Victims For Sale is a nail-biting thriller experience. A heart-racing edge-of-the-seat read< devastatingly mysterious, flinching and gorgeously spun into words that will not let you leave it halfway. I'd recommend this read to all who take pleasure in psychologically disturbing criminology. READ MORE. Here is a look at the novel that takes you through the dungeons of dark secrets and walks you through the other side of the world. This fiction novel … takes you on a whirlwind of dangerous alleys, vulnerable situations and dark secrets, which... READ MORE. 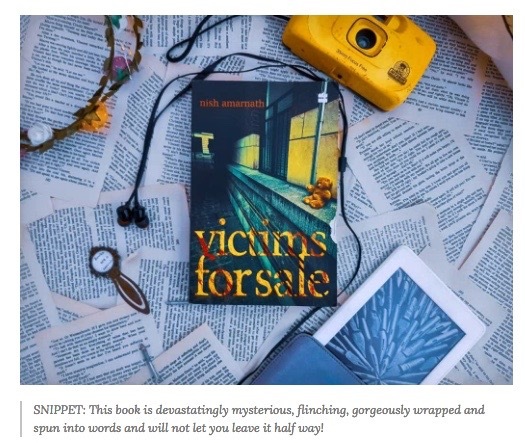 Victims For Sale, a thriller by Nish Amarnath, takes you on a whirlwind journey that Sandhya Raman (Sandy) experiences in London. READ MORE. It was clear that Sandy was an opinionated and intellectual personality. Her code of honor and her ability to sift between what’s right and wrong kept her going in the book. They were also the qualities that made her stand out from the other characters in the book. READ MORE. This very illustrative story of the settings of London and every one of the intricate details of the crown’s domain emerges... READ MORE. Subscribe to our new channel! Storytelling is intrinsic to human existence. Inspired from the book, VICTIMS FOR SALE, this channel is about everything that makes us human. Come join us! AND CLICK THESE FOLLOW BUTTONS TO STAY TUNED FOR MORE! This video features an insider to the 'bestselling crime-thriller fiction novel, Victims for Sale' from the author Nish herself. Don't miss it! TITLES, LOGLINES…AND HOW I FOUND MY LITERARY AGENT: Believe it or not, I whittled down my manuscript of Victims For Sale from 300,000 words to 125,000 words before I began querying literary agents. 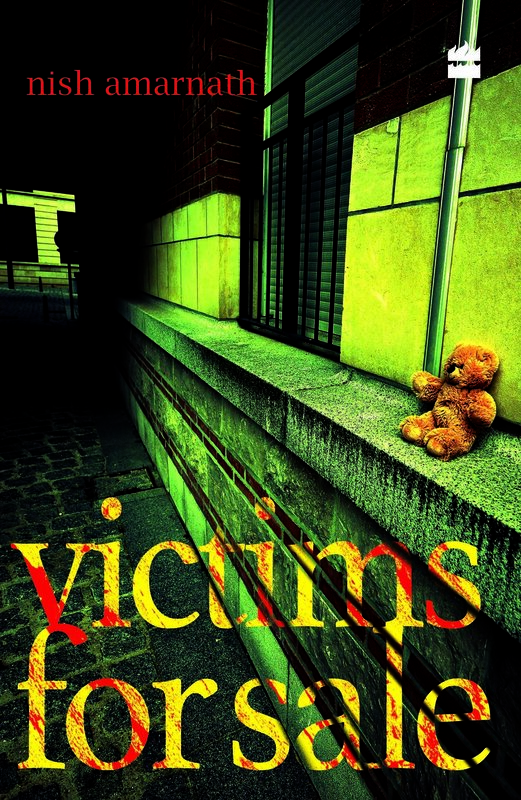 AND…Victims For Sale was about 90,000 words when it went to press at HarperCollins! VICTIMS FOR SALE BEHIND-THE-SCENES: At this forum, I address the importance of first-hand information and sensory experience in giving true-life fiction more authenticity. In that regard, I share my experience sitting in on a murder trial experience at London's Old Bailey and my key takeaways from a luncheon with Jackie Malton (formerly a senior officer at the Metropolitan Police Service of London’s Scotland Yard) while researching for my bestselling psychological thriller, VICTIMS FOR SALE. A snapshot of a fun quiz that was done on Victims For Sale's suspense sequence series / theme song video, Fallen Angels - during the reading and signing of this spine-chilling thriller novel at the British Council on Jan. 16, 2019. It was absolutely fantastic seeing scores of readers and British Council patrons come together to partake of an interactive multimedia experience during this bookreading! A collage of pictures from the FICCI-FLO forum in Ludhiana, Punjab, where ‘Victims For Sale’ marked the inauguration of a new book club, to start 2019, under the patronage of FICCI-FLO, a division of the Federation of Indian Chambers of Commerce and Industry (FICCI). After the Victims For Sale ribbon-cutting! Fallen Angels, which is Victims for Sale’s theme song interpolated into a suspense sequence series trailer, plays at FICCI-FLO’s inauguration of a new book club to start 2019. Panel discussion on the role of fiction in solidifying identity construction. 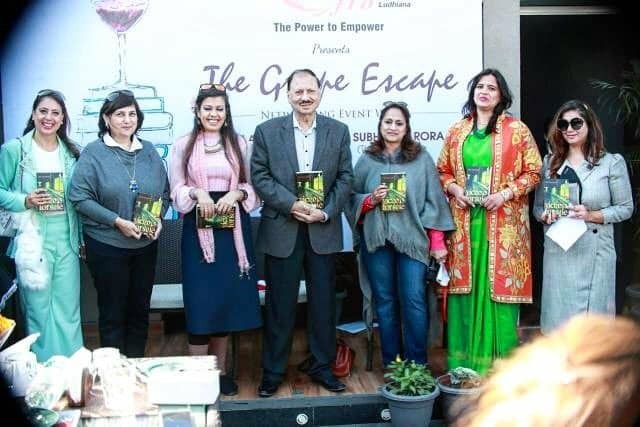 The ‘Grape Escape’ saw a massive turnout of women from diverse walks of life. This photo was taken during the broadcast of Fallen Angels. A video segment of my felicitation speech at the Rotary Club's Mother's Day commemoration in Chennai and what Victims For Sale means for mothers, young and old. LITERARY CONVENTION AND BOOK-READING. FICCI-FLO. 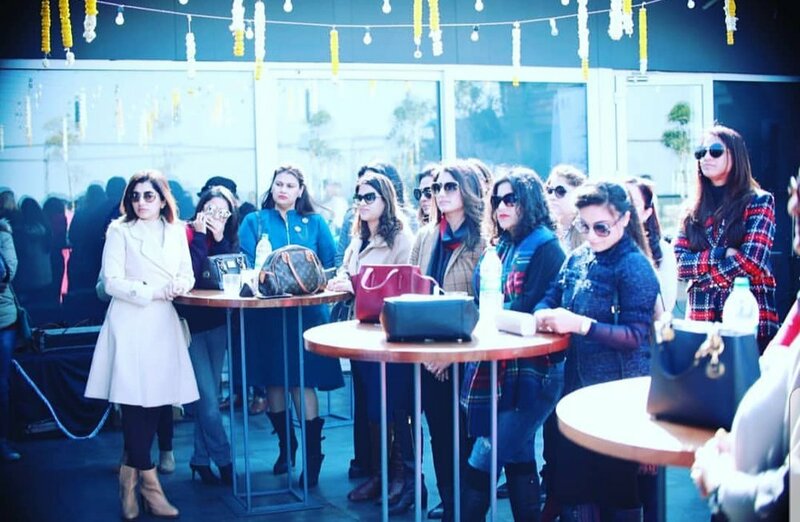 Oxford Bookstores hosted this event in partnership with the Young FICCI Ladies Organization, or Y-FLO, involving other stakeholders and partners including HarperCollins, the U.S. Consulate in Kolkata and The American Center in Kolkata. This video provides a snapshot of a conversation with writer, poet and activist Saira Shah Halim, following a book unveiling and a keynote address by Jamie Dragon, officer at the U.S. Consulate Kolkata and Director of the American Center. (Excerpts of the chat with Saira). A segment of VICTIMS FOR SALE's launch at Odyssey, Chennai. Speaking at Odyssey, Chennai. Hindu Publishing Group Chairman N. RAM as Chief Guest. US Consulate Information Officer ALEXIS WOLFF and lawyer, columnist, talk show host and former NDTV Bureau Chief SANJAY PINTO as special guests. Launch and Discussion at Oxford Bookstores, New Delhi. In conversation with author and NDTV's star anchor Sunetra Choudhury. (Interview excerpts). The two women discuss the storyline and key characters of VICTIMS FOR SALE. A snapshot of the first scene of 'Victims For Sale' read at The Spoken Wave Art, Music and Literary Festival. Lecture/Talk to 300+ students at a MEET THE AUTHOR session. Spring of 2018. STELLA MARIS COLLEGE. Nish has an engaging session with hundreds of students, where she shares her journey as a writer. Maria, an English Lit student interviews Nish who shares her challenges of writing VICTIMS FOR SALE amid a changing reality.